Quilting has been around for a very long time. According to Quilting in America, quilting was around long before it became popular in the United States. Other countries used the padded material for bedding and even armor. When settlers arrived in the New World, the quilted layers became a necessity to survive the cold winters. Today, quilting is not a necessity of life like it was back then, but people still enjoy the fine art. Beautiful quilts are created every year and used for bedding, place mats and wall hangings. With the fast pace of life these days, few people want to spend the hours it traditionally takes to make a quilt by hand, so quilting enthusiasts have come up with great ways to simplify much of the quilting process. Watch the Quilt in a Day video below, which shows the lovely and useful "twice as nice" technique. Eleanor from Quilt in a Day demonstrates this technique, which creates twice as many types of blocks out of your material. She recommends using her special 9.5-inch Square Up Ruler for making the task easy. 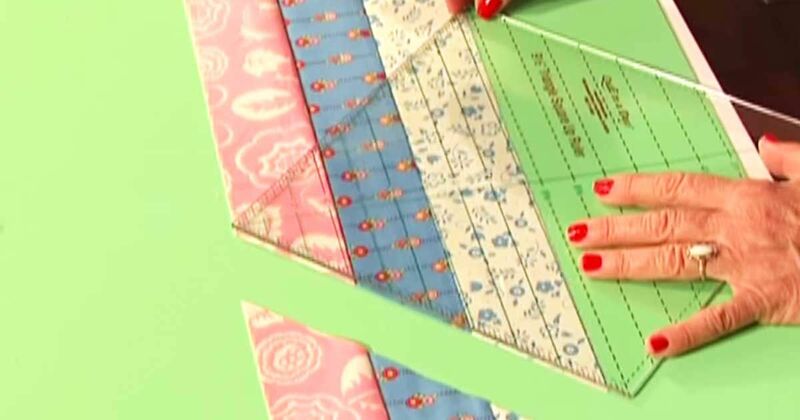 Start by cutting three types of material into 3-inch strips and sewing them together. Once the strips are joined, press all the seams in the same direction. Now you are ready to start cutting. Using the Square Up Ruler, turn it so that the 9 is facing up. Place the square so that the 9-inch line runs across the bottom of the material and one of the points is at the top. Cut a triangle; rotate the square, and cut again. You want a total of four squares from your material. To make your triangle block, place matching triangles opposite each other, fold them face first onto each other and stitch. Open the seam, and stitch the opposing side. Eleanor teaches how to do a swirl in the center of the block that locks the triangles into place. With the remaining fabric, you can cut off the "triangle" end and then cut the rest into 2.5-inch strips. Use sets of three strips to create nine patches. The small triangles that you cut off the end of each set of fabric will become triangles for small triangle blocks. With Quilt in a Day's technique, all of your fabric is put to use. You can cut pieces for multiple quilts all at once, saving you time on future projects. With timesaving techniques like this, what's not to like about quilting?